Henri Nyakarundi and Elizabeth Kperrun are the winners of the first edition of the “ICT for Social Good”, financed by Innovazione per lo Sviluppo Program and Fondazione Mission Bambini Onlus. They will be officially awarded during the Open Days of Innovation, scheduled in Milan, on November 6th and 7th. The first edition of the “ICT for Social Good” Grant started in March 2017, when Ong2.0 opened a call to invite social innovators to apply for a prize of 12.000 euros – offered by Fondazione Cariplo and Compagnia di San Paolo within the Programme “Innovazione per lo sviluppo” – to sustain and support innovative ideas created with a bottom-up approach in low-income countries. Fondazione Mission Bambini added a special grant named “ICT 4 Children” equals to 10.000€, to the project focused on children more aligned with the Foundation’s mission. The aim of both Grants was to sustain, as much as possible, local entrepreneurs but also to inform the development sector – too often still based on traditional intervention models – about local innovations. In the Global South, many amazing projects, realities and innovative ideas are created daily with a bottom-up approach. Unfortunately, often these ideas are not fully recognised and they face difficulties in being involved in international development projects. However, they represent a good starting point to build a new approach to the international cooperation and local development. In two months, 233 applications were received from 57 countries in the world. The Scientific Committee of the Grant – composed of representatives from SocialFare, Fundacion Paraguaya, Moxoff, E4impact and Nesta – worked hard to evaluate the projects, paying close attention to innovation, both from the point of view of technology and of the methodologies and approaches that have been adopted. The main focus was on the positive impact the projects could generate at the local level. Henri Nyakarundi wins the main Prize with Ared, his Rwandan social enterprise, followed by Elizabeth Kperrun, who wins the “ICT for Children” Prize with her Nigerian startup, Lizzie’s Creations. Let’s take a closer look at the two winners. The Rwandan social entrepreneur, Henri Nyakarundi is the founder of Ared -African Renewable Energy Distributor- a hardware, technology and service company who developed Shiriki Hub, a mobile solar kiosk, which offers customers a convenient low-cost solution to charge their phones, to browse the web and to have free offline access to digital content such as news and information on health and education. The Scientific Committee of the Grant evaluated Nyakarundi’s project as the best one among the 233 applications received. Elizabeth Kperrun is the co-founder of Lizzie’s Creations, an initiative that aims to revive the African traditional culture and storytelling through digital tools. She creates fun educational mobile apps that teach kids using Africa’s native languages. Elizabeth startup has been evaluated as the second best project among all the applications received and the best proposal for childhood, so she wins the category dedicated to the use of ICT for children. Get to know Elizabeth better. Read the interview. The winners will be officially awarded during the Open Days of Innovation, scheduled in Milan, on November 6th and 7th 2017. Elizabeth Kperrun is the winner of the “ICT for Children” Grant, a special recognition offered by Fondazione Mission Bambini within the framework of “ICT for Social Good” Grant. The Grant was created to reward the project that better represents the usage of innovation for childhood. Elizabeth is the co-founder of Lizzie’s Creations, an initiative that aims to revive the African traditional culture and storytelling through digital tools. She creates fun educational mobile apps that teach kids using Africa’s native languages. Researchers have shown that many children in Africa do not speak their country’s lingua franca (typically English, French, Portuguese or Arabic) as a first language. However, these same children are expected to learn in these languages. This creates a unique problem, making the assimilation of what is being taught harder and generally extends the learning time. According to the UNESCO, the best way to educate children is through their mother tongue. Fluency and literacy in the native language lay a cognitive and linguistic foundation for learning additional languages. Some people argue that producing learning materials in a variety of African languages is too costly in economic terms. Elizabeth and her team tried to face this issue, creating a suite of mobile applications which educate African children using their native languages. Elizabeth noticed that there is a lack of culturally relevant educational material for African kids on the popular app stores. So, she started creating quality content that allows kids learning in their native languages, which has been proven to speed up their understanding. The direct beneficiaries are the children aged 1-10 who directly use the apps and learn the basics (Numbers, Letters, Object recognition) as well as important cultural values. “Folk stories were a great part of my childhood. Apart from the obvious entertainment factor, I learnt a lot of life lessons and morals from folk stories and I do not think they are a culture that should be forgotten”, said Elizabeth. Afro Talez is an application that narrates traditional African folk stories, teaches morals and life lessons to children aged from 2 to 10 years old. It’s an app structured in episodes, the first story is already available and it’s titled “The Tortoise, Elephant and the Hippopotamus”. This story extols the intelligence of folk hero ‘Mr. Tortoise’, who usually faces and overcomes challenges in new and unexpected ways. If you are wondering about the advantages of going digital, in the app you will find some features as interactive games on standard classroom lessons such as counting, object recognition and more. Download the app and start exploring Lizzie’s Creations world. Teseem-First Words is the second app series developed by Lizzie’s Creations. This app teaches kids their first words in English as well as in some major African and Nigerian languages, including Hausa, Swahili, Igbo and Yoruba, by using locally relevant scenes and objects children are familiar with. For example, they could learn words related to colours, numbers, body parts and more just touching the screen and interacting with the nice animation. The two apps are monetized using in-app purchases. Users can download the app and use it for free, but there is certain content that is available for a small fee or via rewarded video ads that allow users to unlock the premium content for a few hours by viewing a targeted relevant video. Henri Nyakarundi is the CEO/Founder of Ared company and the winner of the “ICT for Social Good” Grant, organised by Ong2.0 within the Innovation for Development Programme. In Rwanda, Nyakarundi developed Shiriki Hub, a mobile solar kiosk, which offers customers a convenient low-cost solution to charge their phones, to browse the web and to have free offline access to digital content such as news and information on health and education. The Scientific Committee of the Grant evaluated Nyakarundi’s project as the best one among the 233 applications received. We asked him some questions to get to know him better and here is what we discovered. Let’s start from the very beginning, where are you from and what’s your family and education background? I was born in Kenya but grew up in Burundi but we were refugees from Rwanda. When I graduated high school in 1996, my parents decided to send me and my sister to the USA to continue our studies because the region was unstable. Burundi was at war and Rwanda was recovering from a genocide. We got our Rwandan citizenship in 1995. What did you study and where? Who had the biggest impact on your career? My mother. My mother was the backbone of our family, she put us through college, had a full-time job and running businesses on the side to pay our tuition. Even though we were refugees in Burundi, we were able to get the best education, her work ethics and discipline was unmatched. She owns her home in a time where it was difficult for women to own properties. Every time I am down, or want to give up I just remind myself of the struggle she went through and I quickly move forward. Why did you decide to turn back to Africa and why did you choose Rwanda as the country to live in? In 2009, I started coming back to Africa on a regular basis, and I started seeing how the narrative of the continent was changing. Innovation was booming. In the US, I had reached a plateau and iI did not feel that I can have any positive impact there. Because Africa was and is facing so many challenges, I knew this is where I can best apply some of my skill set. Rwanda had changed dramatically, it was easier to start a business, today you can register a business in 4 hours, they have good infrastructure, great place to pilot new technology and of course the fact that I was Rwandan also motivated me more to start there. I read somewhere that you are “an entrepreneur at heart”, is this true and what does this mean for you? It means at least to me, I was born to be an entrepreneur. I started my first business when I was 20, and I fell in love with it even those it took me 10 years to build my first successful business. I almost quitted school to pursue it full time even then but my mother let just say deter me from quitting. I love solving problems and I believe that is what an entrepreneur is all about. How do you create Shiriki Hub? Where the idea comes from? Initially, Shiriki Hub was supposed to be a simple charging kiosk. The idea came from my travel in Burundi and Rwanda and seeing people having their phones but always looking for a place to charge them. I was not planning to build my own product. In the beginning, I was looking for an existing product but could not find one. I was seeing charging solutions at the airport, and I thought it would be great to have that on the streets of Africa to help people. That is when it all started. I hired a designer and an engineer and then the journey started. What is the biggest challenge when, as you said on Ared website, you do business at the “base of the pyramid”? First, people mindset, bring innovative solutions and innovative business model it takes time for people to understand and adopt it, so you have to spend a lot of time educating the people. Second, building a technology suitable for the terrain of rural and semi-urban Africa is extremely hard. Finally, building a sustainable business at the base of the pyramid is extremely hard. What’s the aspect of your job that keeps you awake at night? Running out of money before we can scale, finish our technology and build a sustainable business. This is hard and it requires strong financial backing for us to be successful. What is the best professional advice you’ve ever received? Never give up no matter what, there is always a solution to a problem. What role that ICT could play in strengthening the local development and the business ecosystem in Africa? I believe ICT is the key that will bridge the information gap that exists with low-income people. Access to information is key to improve someone’s livelihood. However, it is still considered a luxury in a lot of communities. As we are facing global warming, and Africa will be most affected continent, accessing key information to minimize the effect of global warming will be a matter of life and death in the future. Also ICT has open the door to a new generation of entrepreneurs, all you need now is human capital and an internet connection to build an app. I believe ICT has opened the door to a new set of creative mind and has given hope to a whole new generation of young Africans. How can Shriki Hub be considered an inclusive business? Shiriki Hub is specifically targeting low-income people, especially women and people with disabilities that have no other opportunities to make a living. We also focus on refugees that are, a lot of time, not included in any economic opportunities of the countries they live in. A lot of people are willing to work, want to work but because they do not have a college degree or come from poor families they lack option and this is why Ared was developed. What’s the price for a phone charge? And for browsing the Internet? In Rwanda is 10 cent, the internet is sold in increments of 5, 10, 30, 60 minutes and it is free for the 5 and 10. They pay 30 cent for 30 minutes and 50 cents for 60 minutes. In terms of revenues, what is the core business of Shiriki Hub? We have 3 revenue streams. 1. We share revenue with our micro franchisees on the sales of digital services like airtime, internet, gov services etc…. What is the average net revenue per month that Shiriki Hub provides to kiosk operators? Micro franchisees generate on average 100$ a month on all services they provide on the kiosk. The goal is to add more services to increase both or our revenue. What is the relationship between kiosk operators and Ared company during all the business phases? We are partners, therefore we work closely together. The reason why we pick a micro-franchise model is that it’s a win-win situation. We provide the training, support and maintenance and the micro franchisees takes care of the end users. This is the key to being sure that the whole value chain is fluid enough so issues can be addressed quickly. Where the kiosk components are made and why? Battery and panels come from China, the wheel from Australia, the router system from the USA and the frame is made locally. Is the government supporting somehow the social entrepreneurs in Rwanda? What could it be done better? Not yet, we need tax law to better support social entrepreneurs by offering a tax credit, for example, NGOs are exempt from taxes, but because we are for profit we are taxed like a traditional business even those our focus in social impact first. We need our own tax categories, we need better access to funding, grants for R&D, we need an easier way to work with local government so we can reach to more communities on the ground. The government need to facilitate partnership so we can work together and speed up the impact. One of the biggest challenges in Rwanda, is that urbanization has banned a lot of the street vendor business and people are not given alternatives. The bottom line is we fighting the same fight, better the lives of people, if we do not work together we might fail on the fight against poverty. How many kiosks are now operative and in which countries? We have 25 solar kiosks in Rwanda, we just launch in Uganda in May, we just received most of our licensing so we plan to start our pilot project in November with 5 kiosks. What is your message to social entrepreneurs? If you do not have the passion to help others and solve huge problems do not become a social entrepreneur because it is harder than traditional business. Patience and extreme focus is the key. Expansion, expansion, expansion. More than 400 million people live in poverty in Africa, so the need of solutions like ARED is in high demand, We want to be in 20 countries in the next 10 years, implement around 100000 solar kiosks. But first we need to finish our product development, we working on adding IOT technology on the kiosk to better monitor the kiosk on the ground and collect additional data. The “ICT for Social Good” Grant is entering its final stage. After a selection process lasting three months, the list of candidates for the two individual grants of 10,000 and 12,000 euros each – financed by Innovazione per lo Sviluppo Program and Fondazione Mission Bambini Onlus – has been narrowed down to 25. We are happy to introduce to you the extraordinary projects that have been shortlisted and are going to be evaluated by an International Jury of excellence. 233 innovative projects from 57 countries were initially selected based on formal criteria, adherence to the guidelines and requirements, and according to the analysis of all documentation requested. Projects entering this last selection stage are the final 25. The Scientific Committee of the Grant – composed of representatives from SocialFare, Fundacion Paraguaya, Moxoff, E4impact and Nesta – has begun evaluating the projects, paying close attention to innovation, both from the point of view of technology and of the methodologies and approaches that have been adopted. The main focus is on the positive impact generated by the projects at the local level. The winners will be announced at the end of September and the grants officially awarded during the Open Days of Innovation, scheduled in Milan, on November 6th and 7th. The 25 shortlisted innovators come from sixteen countries. The most represented countries being Nigeria and Kenya, both with four projects each. The African presence is very strong as twenty of the twenty-five finalists come from this continent. Of the remaining projects, two are from India, one is from Bosnia Herzegovina, one from Cambodia, and one from Colombia. Nearly 40%, or 9 out of 25, of the finalist projects were presented by women, resulting in good female representation. While there is often talk of a gender gap in technology access, these “ICT for Social Good” innovators seem to counter this notion. As a percentage, women’s projects have risen from around 25% of the total initial applications to 36% of those that are in the final shortlist, demonstrating a high level of competency and quality among the proposals submitted. The issues addressed most by the applicants concern agriculture and health, as well as the themes of education and of participation in political and public life. Seven of the finalists are tackling child-related issues and they will compete for the Grant funded by Fondazione Mission Bambini Onlus, specifically dedicated to this target. Muhammad Abdullahi of eTrash2Cash, a technology-based waste management social enterprise based in Nigeria. It uses the web and mobile app platforms to register and collect major types of wastes from low-income individuals and households and exchanges them for cash incentives directly through their mobile bank accounts. eTrash2Cash uses wastes to create reusable materials. Food wastes are converted into organic compost to be sold to Nigerian farmers, low-cost tissue paper is produced from paper wastes, and plastic refuse are used in making termite-resistant tables and chairs for school children. Elijah Amoo Addo of Food for all Africa program, a not-for-profit start-up with a mission of creating sustainable means of nutrition and food security for vulnerable people, mostly children. This is done through food banking, farming and a forum that ensures efficient use of food within the supply chain in Ghana. A mobile and web application enables food sharing by connecting vulnerable communities to surplus food. 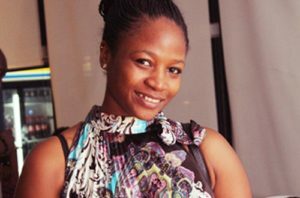 Bukola Bolarinwa of Haima Health Initiative a project that deploys an innovative Blood Supply Chain System (BSCS) to complement the current structure, with the aim of tackling the blood supply shortage in Nigeria. Haima Health Initiative leverages technology to improve blood availability for people in need, and to reduce blood racketeering and ‘blood black market’ operations. This is executed by the construction of Nigeria’s first mobile and web platform backed by a database of voluntary blood donors who are then connected to patients in real-time using Global Positioning System (GPS), mobile and web technology. Ahmed Karim Cisse of Connexion Sans Frontiere, uses ICT for a telemedicine project dedicated mainly to trauma patients, for example, victims of road accidents in Senegal. Gabriel Diago of Fundación Educativa Gimnasio Los Caobos, based in Colombia, has developed a platform dedicated to interactive, educational games designed for children with Down syndrome. Albin Mathias Fiita of Potential Enhancement Foundation installed solar energy-powered computer laboratories in Tanzania, using low-power Raspberry Pi computers and open source software to make laboratories sustainable over time. Kristin Gaensicke of Riziki Source, a platform that bridges the gap between the job market and persons with disabilities in Kenya. It enables access to job opportunities for persons with disabilities by collecting relevant data from text messages. The information collected is used to form a profile of the job seekers available through the online platform, where employees can easily access it. The platform also informs employers the type of disability, thus enabling them the allocation of appropriate jobs or putting accessibility needs into consideration during job interviews. Elizabeth Kperrun of Lizzie’s Creations, creates fun, educational mobile apps to teach kids using Africa’s native languages, in Nigeria. 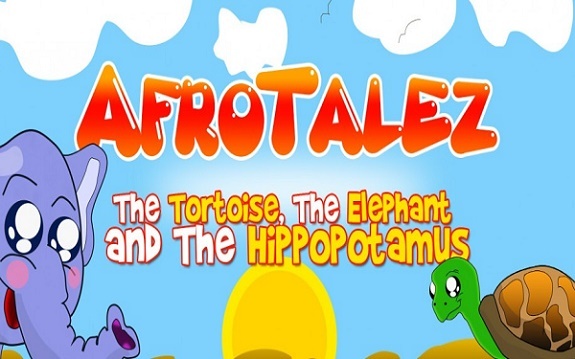 The first app series AfroTalez narrates African folk tales to kids while also tackling standard classroom lessons such as counting, object recognition, and more. 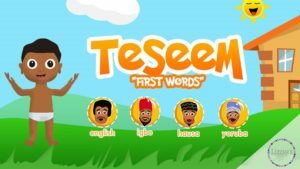 Another series Teseem teaches kids their first words in English, as well as in their native African languages such as ausa, Swahili, Igbo and Yoruba. Suzana Moreira of Mowoza in Mozambique, works with Mabiz, an education solution delivering business-related content to female-led micro and small businesses via SMS and WhatsApp. Many female micro and small business entrepreneurs in Mozambique have no formal education and struggle with stagnating businesses. By creating awareness of business concepts these traders are able to make better decisions while investing their resources wisely. Clever Mukove of Knowledge Transfer Africa in Zimbabwe, worked on the creation of eMKambo, a web and mobile application dedicated to exchanging information on agricultural issues, market prices, and connecting producers and traders. Jennifer Nantale of Nyaka School, in Uganda, has developed Patient App Care a mHealth, an Android-based application, working as a medical reminder system to improve people’s (mainly HIV/AIDS patients) access to medicines and healthcare. Grâce Françoise Nibizi of SaCoDé , in Burundi, has been working to raise awareness among citizens, especially women, on issues related to sexual and reproductive health using an interactive SMS information system. Margaret Njenga of @iLabAfrica is conducting a project that involves the supply, implementation, and commissioning of a business intelligence, analytics and automated online revenue accounting system for county governments in Kenya. County Pro, the name of this project, aims to increase citizens’ participation in county government processes, as well as increase transparency. Achiri Arnold Nji of Traveler, a mobile phone app that monitors the performance, speed, location and number of passengers on a bus. With the help of big data and machine intelligence, the app alerts drivers and authorities to potential dangers in Cameroon. The system automatically sends high-speed alerts each time a given bus runs above regulatory speed limits. With an integrated cloud service and a ‘back-end’ monitoring system, it can provide predictive analysis and recommendations to road safety officials that can help reduce road accidents. Should an accident occur, the app automatically detects it and notifies its location to emergency services, hospitals, and families of all users. The app is designed to work with or without an Internet connection. 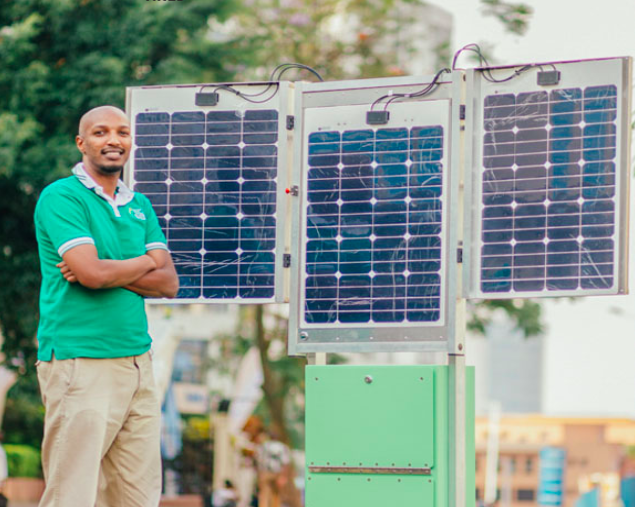 Henri Nyakarundi of Ared, a Rwanda based company that provides a business-in-a-box solar kiosk platform, called Shiriki Hub, to empower low-income individuals with the use of a micro-franchise business model. The kiosk is a self-contained unit from which mobile money, airtime, advertisement, and digital content using wifi technology can be purchased, as well as where customers can charge their mobile phones and other small devices. Through this technology, they can provide affordable access to key services and digital access to low-income people, while also addressing the significant unemployment problem in the region. Francis Obirikorang of AgroCenta has developed an agri-tech platform offering a suite of services designed to empower rural smallholder (?) farmers in Ghana. These services include up-to-date commodity pricing information that allows farmers to sell their crops at fair market value, an on-demand logistics service to facilitate crop deliveries and prevent food spoilage, an online platform to arrange sales, and electronic payment services leveraging local mobile money providers to process payments. These services are designed to address rural farmers market exclusion and provide technologically assisted market linkages. Simeon Oyando Ogonda of Education for Change in Kenya, he uses the m-shamba platform to train people in rural areas to the use of alternative green methods when cooking food and/or managing pests in agriculture. Daniel Oulai of Grainothèque, the first Community library in Ivory Coast dedicated to seeds, born to preserve African biodiversity, but also to ensure access to young farmers to traditional seeds and training courses. The project includes the creation of a web platform dedicated to topics as seed reproduction, how to adapt agricultural production to climate change and to improve the marketing of local products. Emmanuel Owobu of MobiCure, in Nigeria, has developed the OMOMI app that allows mothers to monitor their children’s health and growth by receiving targeted information during different stages of their babies’ lives. Alexie Seller of Pollinate Energy in India, offers ecological products that can improve the quality of life within Indian suburbs and uses mobile technology to handle payment rates. Victor Shikoli of Hydrologistics Africa, in Kenya developed HydroIQ, a GPS- and internet-enabled device that is plugged into existing water supply systems in homes or businesses and along water distribution networks, to automatically monitor water use, quality, and leakages using sensors that send data to an online platform in real-time, thereby turning traditional water systems into smart water grids to improve inefficiencies, sanitation and hygiene. Sumeysh Srivastava of Nyaaya, India’s first free online repository of every central and state law explained in simple English with interactive guides and visuals to make it easier for people to be aware of their rights and duties. Sovan Srun of Edemy, in Cambodia has created a system to equalize access to quality English by improving students’ and teachers’ education. Edemy avoids the need for constant Internet connectivity when delivering online education and works by using a cheap Rasberry computer and educational in-house software developed for this purpose. Branko Vasiljevic of Civil Patrols, developed software to improve and support communication and cooperation between civilians and police/public safety institutions with an aim to make their environment safer by joining forces. It allows end-users to report illegal activities to the appropriate institutions via secured online communication channels in Bosnia Herzegovina. Emily Warne of Health Builders, uses ICTs to network and digitize medical information to make health centres more efficient in Rwanda. Who are the protagonists of social innovation around the world? In this video gallery we have collected the pitch decks from many of the innovators who have successfully passed the first stage of the selection process of the “ICT for Social Good” Grant, created by Ong2.0 and realised within the Innovazione per lo Sviluppo Program, thanks to the support of Fondazione Cariplo, Compagnia di San Paolo and the collaboration of Fondazione Mission Bambini Onlus. To present their project, their idea, their reason for working passionately every day, in a span of thirty seconds is a challenging task. Many innovators of the “ICT for Social Good” Grant, however, accepted this challenge with great enthusiasm and tried their best to briefly introduce themselves and their projects. This video gallery was created to offer an overview of the variety evident in the social innovation sector. It is a world populated by people of different origins, aspirations, ages … a sign of how ICTs are versatile tools that can be adapted to contexts and needs in the service of a more inclusive kind of development. Let’s have a look at the video playlist. Every deficiency has at least one solution, and it’s just a matter of identifying the one that suits best. This seems to be the idea that inspired the work of the participants in this first edition of the “ICT for Social Good” Grant. So, if citizens in Bosnia-Herzegovina don’t feel safe enough, they can join forces with and help the police/public safety institutions to make their environment more secure by using Civil Patrols, a software that helps end users report illegal activities to the appropriate institutions via secure online communication channels. To help the hearing-impaired in Colombia overcome communication barriers they encounter every day, a virtual interpreter is available on PCs and smartphones. In Nigeria, in order to counter the black market for blood transfusions, and encourage the meeting and the exchange of information among donors, patients and health centers, Bukola Bolarinwa founded Haima Health Initiative, an application accessible on PCs and mobile devices. In India, the Nyaaya platform supports citizens’ access to state laws with the use of guides and tutorials. Availability in various local languages ensures that everyone is able to truly understand his or her rights. If traditional African identity and knowledge are likely to be lost, the app developed by Elizabeth Kperrun helps children rediscover fables in their local language, and have fun while learning in English, Hausa, Swahili, Igbo, and Yoruba, providing everyone with access to quality educational content. According to the World Health Organisation, in Cameroon deaths caused by road accidents exceed those due to malaria by 40%. As a result Achiri Arnold Nji decided to develop Traveler, a platform that uses big data, GPS systems, and sensors to monitor the performance of bus drivers, improve passenger safety, and respond in case of accidents. Not everyone develops new or highly technological solutions. In Benin, where people with albinism still face prejudice and discrimination, Franck Hounsa educated a group of 20 albinos on blogging and digital writing so they can raise awareness on what this congenital disorder really is, to help prevent the spread of prejudice and discrimination and get other albinos out of isolation. In Ivory Coast, Daniel Oulai combined offline and online methods through the creation of “Grainothèque” -the first Ivorian community library dedicated to seeds- created to preserve African biodiversity, and to ensure young farmers’ access to good quality native seeds. The project is accompanied by the creation of a web platform dedicated to agro-topics such as seed reproduction, how to adapt agricultural production to climate change, and how to improve the marketing of local products. There are many solutions dedicated to agriculture, as well as products and services targeting women’s health and empowerment. In Burundi, where access to the Internet is limited, social organisations have registered strong demand for good information on sexual and reproductive health issues. To cope with this need, Grâce Françoise Nibizi and SaCoDé association put in place an SMS information system. While in Nigeria, Emmanuel Owobu created MobiCure, an app that allows mothers to monitor their children’s health and growth by receiving targeted information for various stages of their children’s development. In Mozambique, Suzana Moreira is working to improve women’s access to entrepreneurship through a training program and a direct support system realised via SMS and social media. Among the videos received, there are also some Italian examples. Organizations such as IPSIA, CINI Italia e Global Health Telemedicine Onlus presented innovative projects realized in different countries in the fields of education, women’s protection and struggle against early marriage, and telemedicine. The basic rule for everyone is to focus on effectiveness, not on the use of technology in itself, but on the use of ICTs as tools to create a concrete and positive impact at a local level. 233 innovative projects from 57 countries all over the world, this is the positive outcome of the first edition of ICT for Social Good, the Grant organised by ONG2.0 – within the Programme “Innovation for Development” promoted by Fondazione Cariplo and Compagnia di San Paolo – in collaboration with Fondazione Mission Bambini, to sustain and support innovative ideas created with a bottom-up approach in low-income countries. An education app in the local language for spreading African culture and history while supporting children in learning. A mobile health system to inform and share basic medical information via SMS. Smartphones as a tool to connect and inform farmers about market trends and cultivation methods for improving and increasing the agri-production. Hot-spots installed in rural areas to let people access information through the Internet or via preloaded content. ICTs as a way to manage the medicine supply in health centres. A YouTube channel as a tool to raise awareness about the risks and the modalities of international trafficking in human beings. These are only a few examples of the 233 innovative projects we received from 57 countries all over the world. At a first glance, candidates demonstrated a high level of competence and creativity in the use of ICT for local development. In order to allow everybody to explore and compare the different projects, we collected on this map all the local innovators who applied for the Grant. By clicking on each waypoint you have access to some basic information. The map is designed to be implemented and to host more and more information over the time. All the applications we received show an interesting cosmos of stories of social innovation: innovative projects, created with a bottom-up approach and able of generating a positive social impact at the community level. These initiatives represent a precious material for raising awareness in the world of international cooperation, paving the way for a new approach to local development. Indeed, all these projects show how important is to have a critical and propositive approach to ICT4D and to give value to local talents and professionalisms engaged for social change. In the coming months, we have planned to tell the stories of the protagonists of ICT for Social Good Grant from their personal point of view. We will collect all these interviews in a special section on the website of Ong2.0. The first session of the selection process has already started. A jury of experts (selected among the actors involved in the “Innovazione per lo Sviluppo” Programme) is currently working to verify, one by one, that all the applications are eligible and congruent with the Grant statements. The candidates considered formally valid will be invited to provide the full documentation and a letter of reference from an authority that can be either internationally (UN agency, development agency, international NGO, etc.) or locally recognised (University, research centre, government, regional institution, etc.) attesting the real implementation of the project. The Scientific Committee of ICT for Social Good will be in charge of the final evaluation. The members of the Scientific Committee are – Guglielmo Gori from SocialFare, the first Social Innovation Center in Italy, – Martin Burt, Founder and General Director of Fundacion Paraguaya, a Paraguay-based NGO focused on microfinance and entrepreneurship, – Ottavio Crivaro, CEO of Moxoff spa, a company specialised on the application of mathematics for the innovation and design of services and products for companies, – Mario Molteni, Senior Fellow of Ashoka for E4IMPACT, a foundation that offers MBA in Impact Entrepreneurship in five African countries, – Giulio Quaggiotto,Innovation Advisor of the Prime Minister’s Office of the United Arab Emirates and Associate to the well-known English foundation Nesta. The winners will receive a money prize. Moreover, they will be invited to Italy to attend the final event of the Innovazione per lo Sviluppo framework, that will take place in Milan on November 2017. Italian entrepreneurial and research entities will be present in order to know the project and, possibly, sustain it. The ICT for Social Good Grant is organised by Ong 2.0, CISV, Fondazione Mission Bambini, Opes Impact Fund, with the financial help of Fondazione Cariplo e Compagnia di San Paolo and the collaboration of SocialFare, E4Impact, Nexa Center, MoxOff, Calandria. Media partner: Agenzia Dire. We believe that innovation is a powerful local development force, capable of generating ideas that transform the life of the communities. This is the reason why we decide to launch “ICT for Social Good” – a grant for creative and groundbreaking ideas, using digital technology for positive social change.